I've been on a bit of a German kick after attending a German food festival a while back. They had the most delicious braetzels (giant, chewy pretzels), a wide variety of sausages (some looking less appetizing than others), sauerkraut (which is delicious by the way - my first try) and also a lovely stew called Szegediner Gulaszch, made with pork, sauerkraut and lashings of paprika. I was so impressed that I immediately hunted down some more German recipes on my trusted intertubes (yes, I'm a lolcat fan, get used to it), and that's how I stumbled across this one over at Recipezaar. I modified it a liiiiiitle bit - you know I have to have garlic in pretty much everything - and it came out quite well. The layers melt together in a cheesy, buttery, onion-y, potatoe-y goodness. Give it a go - I guarantee you'll have a new contender for your favourite comfort food. 1.Cook the potatoes in a pot of boiling salted water until done. 2. Mix together the flour, salt, baking powder, eggs and approximately 1/3 cup water. Dough should be a wettish consistency, but able to hold together. 3. Bring another pot of salted water to the boil. Drop spoonfuls of dough into the water. 4. Cook 15-20 minutes or until dumplings are done in the center. Don't be tempted to take dumplings out sooner, when they rise to the top (as I did). They need a bit more time to get done. 5. Meanwhile, saute onions and garlic in butter until they look glossy and are translucent. Add the mustard as well as salt and pepper to taste. 6. 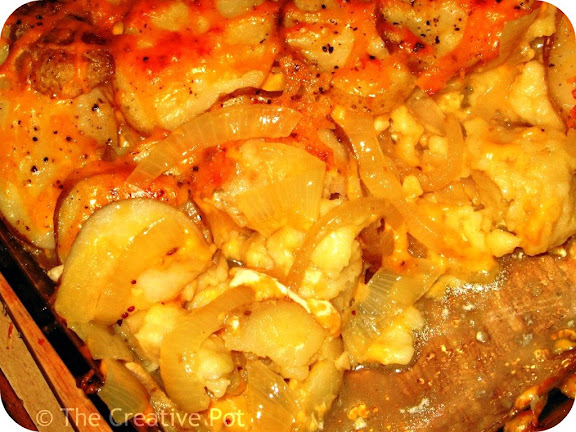 Start layering the ingredients in an ovenproof dish - a layer of potatoes, then a layer of onions, cheese, then the dumplings, topped by another layer of onions and cheese. Finish off with a layer of potatoes. Sprinkle some more cheese on top and also a splash of milk. 7. Bake in a pre-heated oven (180C) for 30 minutes, or lightly browned on top. 8. Serve warm, perhaps with some German sausages on the side. I had no clue what Knephleas were, but now I do. They look amazing! I'm going to have to make this soon. Thanks Jan! I didn't have a clue either until I stumbled across the recipe, but it's really easy to make. Give it a go! I am a German food lover. This is the first I have heard of Knephleas, they sound just up my street!